It's been a while since we've talked about the beauties in this collection, hasn't it? Well, wait no longer! I've got 3 more posts (including this one) set up over the next few weeks to go through the entirety of this collection, even though I've noticed it's currently sold out on Julep.com so if you haven't gotten it yet it might be too late. :( But you can still buy most of the colours individually, so that's something at least! (UPDATE: It's back in stock!) Today we're taking a look at some of the more striking jewel tones in this collection: Angela, Carly and Bette! Angela originally came out in the July 2013 It Girl Box, and it's described as a "deep sea blue molten" with a metallic/chrome finish. This was one of my first Julep polishes ever, and it's still one of my favourites. 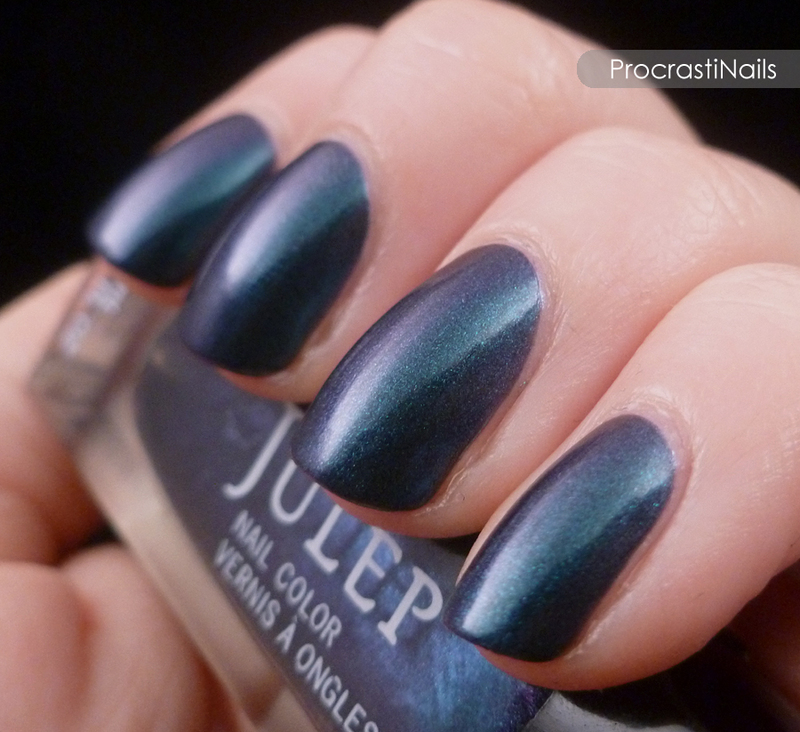 It has a hint of purple/green/brown duochrome in the right light, and the base colour is a lovely deep turquoise. 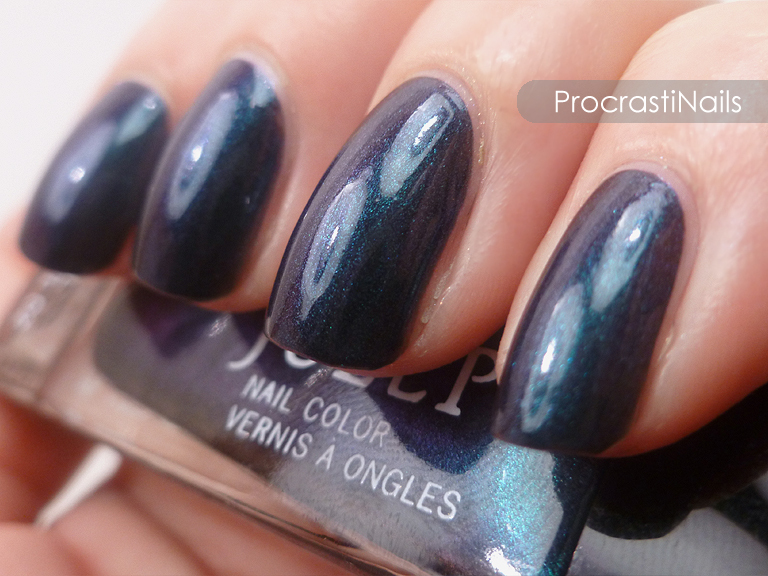 Pictured here is three coats, though you can get away with 2 because it's so opaque if you're in a rush. I wanted to present these polishes in their un-altered forms (no top coats and no undies, so you can see if they actually look like what’s advertised) so it was a surprise for me when I decided to re-swatch Angela and compared the pictures to what came through the first time I swatched it. Then I realized the difference was that these pics have no top coat. And what a difference it makes! Carly is one of those polishes that would be lovely with undies, but without them it's just missing something. 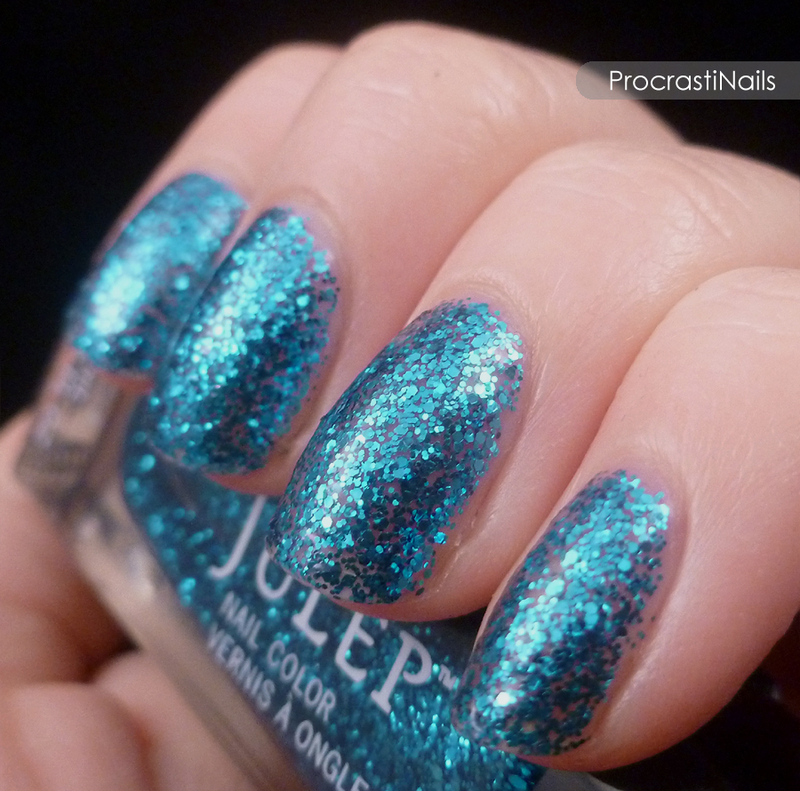 It's described as a "full-coverage Malibu-blue multi-dimensional glitter" and from what I can find it seems to have originally been part of Julep's Glitter & Glow Holiday 2012 Collection and is a Bombshell shade. It's a really pretty polish that contains a ton of small blue hex glitters that are suspended in a clear base, and what you see here is three thick coats. You could probably get it close to full opacity if you did 4+ coats or used the glitter sponging technique but I hate having to put that much work into a simple glitter, so my suggestion would just be to go with similar-coloured undies. Bette is described as a "electric neon purple crème," and originally came out in the January 2013 Bombshell Box. Bette didn't seem to fit with the rest of the colours in this collection at first, because 1) it's a crème polish and 2) it's a neon. I guess they included it because it's technically a jewel tone, and also you could technically use it as undies with some of the more sparse "full-coverage" glitters (like Carly) even though it doesn't match up shade-wise. 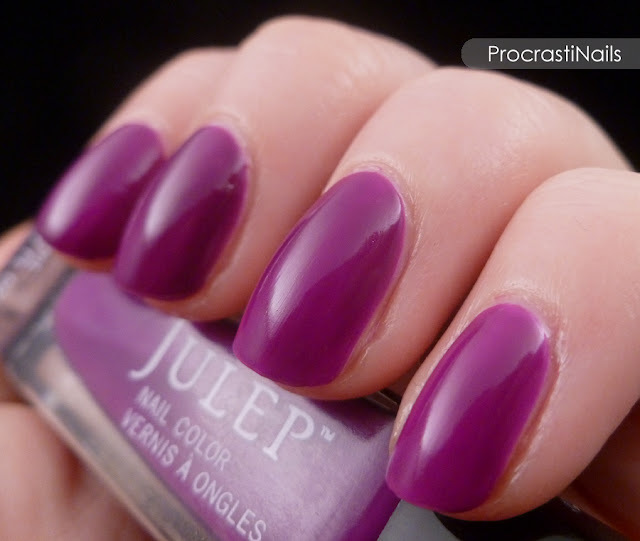 Angela is available on Julep.com for $14.99 ($11.99 for Mavens), and Bette is currently on sale for $4.99 Maven price. Unfortunately Carly is sold out, so if you want to pick that one up you're going to have to get the whole collection (unless they replenish their stock in the future). 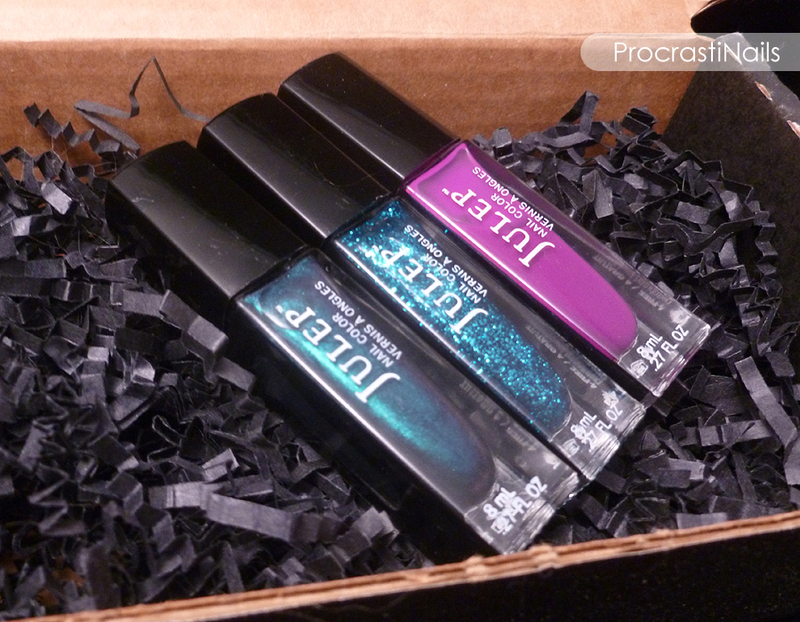 The Gem Collection 2013 retails for $168 (current Maven sale price $84.00) and includes 12 glitter/jewel tone polishes. Let me know which shades you like best, and if you plan on picking any of them up for yourself! That glitter is so nice, if only it were full coverage like it said! Fully agree! If the base was at least tinted or something it would be perfect.